First published 1995 by TWM Publishing. A Year Out of Time is the story of one twelve year old girl from a 'nice' middle-class background, and a 'nice' private school (where her mother hoped she might learn to be a lady) who, in the Autumn of 1940, finds herself pitched into the totally foreign environment of a small Worcestershire hamlet. For the space of one year her life revolves around the village school and its manic headmaster; the friends she makes, notably George Little the 'bad influence, the twee but useful fellow evacuees Mavis and Mickey Harper whose possession of an old pigsty proves the springboard to some surprising and sometimes hilarious happenings, and Mrs 'Arris, the vast and formidable landlady of the Green Dragon Inn. In the company of George Little she awakens to the joys of a new and exhilarating world; a secret world which excludes most adults and frequently verges on the lawless. The year comes to an explosive end and she returns unwillingly to her former life. But the joyous, anarchic influence of the Forest and Georgie remains, and fifty years on is remembered with gratitude and love. Eve Phillips is alive and well and living in Hampshire. She never did become a lady. The Green Dragon Inn stood at the junction of two roads on the edge of the Wyre Forest. The house itself was not a thing of beauty, just a flat-faced, white rendered late Georgian pile under a slate roof. But on a late August evening in 1940 it beckoned a warm welcome to three weary travellers as they dragged their suitcases from the ancient hire car which had brought them rattling and bumping all the way from the Worcestershire town of Kidderminster, threatening at every hill to cough its last. That night, for the first time in many weeks, I climbed into a soft, sweet-smelling bed and, in long forgotten peace and quiet slept … and slept … and slept. I awoke to afternoon sunlight streaming through a tiny window and sounds of laughter and scuffling on the road outside. I scrambled across the huge feather bed to peer at the outside world. The swinging sign of the Green Dragon creaked gently beneath the window. On the un-tarmaced road below a group of boys and girls flipped marbles along in the dirt, shoving, scrambling and speaking what appeared to be a foreign language. I watched them, fascinated, straining my ears to untangle their strange conversation, unaware then that I stood poised at the start of a journey into a hitherto unknown world of childhood, the memory of which would stay with me all the days of my life, vivid and glowing as that first sun-drenched afternoon. 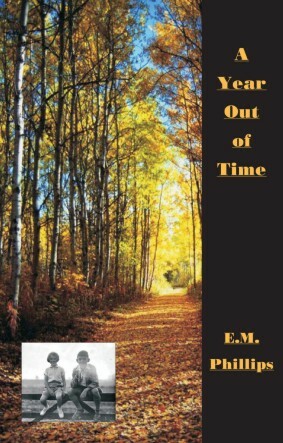 A Year Out of Time is the autobiographical story of one twelve year old girl from a "nice" middle-class background, and a "nice" private school (where her mother hoped she might learn to be a lady) who, in the autumn of 1940 finds herself pitched into the totally forgign environment of a small Worcestershire hamlet. The year comes to an explosive end and she returnes unwillingly to her former life. But the joyous, anarchic influence of the Forest and Georgie remains, and fifty years on is remebered with gratitude and love. Eve Phillips was born in London, England in 1928, the daughter of a Naval Lieutenant and a mother working for the War Office. She lived through much of the hardship and danger of World War II, serving as a teenager in the Girls' Training Corps. She has subsequently worked for the Natural History Museum in London, sold toys in Harrods, trained and worked as a hospital play therapist, been a National Children's Home housemother to a dozen teenagers, acted at the Edinburgh Festival, and owned her own bookshop. She has written extensively for local radio, is host to a weekly writer's group, a member of The Society of Women Writers & Journalists and the Historical Novel Society, and is an associate member of the Society of Authors. She now lives in a small Hampshire town, has three children, and six grandchildren. Her interests include the theatre, Shakespeare, reading, music of all kinds and listening to other people's conversations.